Choose marinated pork loin for a quick and delicious meal. Instead of heading for the drive-through, opt for a quick-and-easy marinated pork loin the next time you're in a rush. Many supermarkets sell marinated pork filets in a variety of flavors, including rosemary and olive oil, garden herb and teriyaki. Pork loin is simple to make, particularly if you choose the marinated versions, and it's healthier than you might think. One ounce of pork loin contains a mere 1.25 grams of fat, which is comparable to a skinless chicken breast, which contains roughly 1 gram. Preheat your oven to 375 degrees Fahrenheit. Line a shallow roasting pan with aluminum foil. Remove the pork loin filet from its packaging and place it in the roasting pan. Cover the pan with another sheet of aluminum foil. Place the pan in the preheated oven and cook for roughly 40 minutes. Remove the aluminum foil cover, and return the pork to the oven for an additional 5 to 10 minutes. Use an instant-read thermometer to ensure that your pork's internal temperature has reached 145 F, as recommended by the U.S. Department of Agriculture. Allow the pork to rest for at least 3 minutes before serving to allow the meat's juices to flow back into the center of the filet. Clean your grill's grate thoroughly and coat it lightly with oil to prevent the pork from sticking. Preheat the grill to medium-high heat for at least 10 minutes. If you are using a charcoal grill, start the coals and allow enough time for them to become hot before cooking. Place the pork loin in the center of the grill after removing it from the package. Cover the grill and cook the pork for 20 to 25 minutes. Use an instant-read thermometer to ensure that the pork has reached an internal temperature of at least 145 F. Set the pork aside on a serving platter. Allow it to rest for a minimum of 3 minutes before slicing. Remove the pork loin filet from the package, and cut it into slices roughly 1-inch thick. Place each slice between two pieces of waxed paper or plastic wrap, and use a meat mallet or the bottom of a small, heavy frying pan to flatten them until they are closer to 3/4-inch thick. Place a small amount of oil in a large skillet, and preheat it over medium-high heat until it shimmers. Place the slices of pork in the heated skillet. 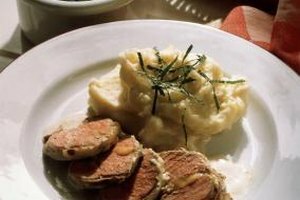 Cook the pork medallions for roughly 6 to 8 minutes, turning occasionally, until they are slightly browned on both sides and cooked through. Use a meat thermometer to ensure they have reached an internal temperature of 160 F.
If you prefer your pork well done, cook it until it reaches an internal temperature of 160 degrees F.
Apples are a traditional pairing for pork, but choosing sides that complement the filet's marinade will also make a delicious meal. Pair Italian-style marinated pork loin with risotto, or choose coleslaw and baked beans for a perfect BBQ-marinated pork meal. Raw pork can cause trichinosis in humans, which makes it very important that you wash your hands thoroughly after handling it. After removing the pork from its packaging, discard any leftover marinade. If you want to use the marinade to baste the pork with during cooking, boil it first to kill any bacteria or parasites that may be present.